Winter isn’t far away, and you are probably busy preparing your home for the coming cold season. While you are checking the HVAC system, sealing the windows and adding insulation, don’t neglect to winterize your garage door. The ice, snow and freezing temperatures can cause problems with the garage door just as they can with your roof, plumbing and other systems. A little bit of prep now in the fall will help prevent costly repairs if, in the spring, your garage door is no longer functioning properly. Here are some tips to winterize your garage door. Does your garage door have proper insulation? If not, then your home’s heated air can escape through the garage, increasing your energy costs. Consider adding insulation to the attic above the garage and the walls around it. Also, add insulation to the door itself. Choose insulation with a high R-value, and cut it to size to fit between the frames of your garage door. You can add two layers, if you wish, for additional insulation protection. Foam board is a great choice, or you can opt for batt insulation if you have a steel garage door. For best results, consider replacing your non-insulated garage door with a new factory insulated garage door. Have you checked the weather stripping around your garage door? When these doors are used regularly, the weather stripping takes a beating. It needs to be replaced regularly to prevent drafts. First, inspect the weather stripping to see if there are any gaps or worn areas. If you find these, replace the weather stripping to ensure that the garage is as energy-efficient as possible. Also, replacing the weather stripping will prevent problems when water freezes near the garage door. Worn weather stripping can stick to this water and the ground, and then peel off when you open the garage door. As you are sealing off these spaces, consider PVC stop molding. This option seals gaps and is a durable choice that will stand up well over the winter weather and ongoing use. Fall is a great time to address routine maintenance needs in your garage, before the temperatures get too cold to make time in the garage enjoyable. First, make sure everything is properly lubricated. All moving metal parts of the garage door need to have a quality lubricant applied before the weather starts to get cold. The cold weather and winter moisture make problems with moving parts and stuck doors even more common, so add some lubrication as you winterize your door. Choose a lubricant designed for garage doors. While you are lubricating the door, remember to inspect for problems. Inspect the springs for rust or other signs of wear and tear. If you notice a problem, have a professional garage door repair technician inspect the door. Before winter hits, remove grit and grime that has accumulated in the tracks of the garage door. Leaves, cobwebs and dirt can impact the function of the door. Start the winter with clean tracks and a clean garage door opening system. If you live in a cold climate where winter weather is extreme, the garage is not going to stay warm, no matter what insulation you add. Unit heaters can keep the space warm. Choose a unit heater that is designed to heat a space the size of your garage, and install it before winter hits. This will protect the door from the damage caused by extreme weather and also give you a warm, toasty space to get in your car every morning. 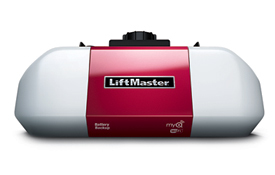 Winterizing your Naperville and Aurora area garage door is not difficult. It just takes a little bit of time and attention. Doing this task now will save you money and stress during the winter as you avoid garage door failure when the cold weather hits. With winter around the corner, my wife and I are trying to get the home ready but we aren’t sure what to do about the garage. I like that you suggest installing insulation for the garage door with a high R-value. This sounds like a great way to keep the garage warm and prevent drafts in the house. Thanks for sharing!